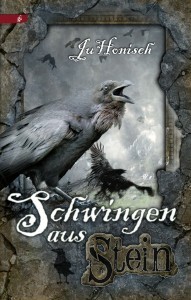 “Schwingen aus Stein” (Wings of Stone), my last novel, won a SERAPH at the Leipzig Bookfair last spring. This was a great honour and brought me a whole number of readings at interesting places before interesting people last year. I should like to thank the organisers and the listeners! The book turned out to be a little tardy in gathering attention otherwise: a few more reviews would be nice. I am paging the ladies and gentlemen of the blogosphere here who do such an excellent – and usually unpaid – job of reviewing those books that do not come with the advertising budget of the mainstream bestseller list. So now we venture forth into this year with a new group reading of the book starting January 16. I shall take part in the event and I would be delighted if a great many people would join this. Those of you who have the novel sitting on the bedside table waiting to be read or simply want to purchase it because Father Christmas was remiss in his duty to bring it – you now have the opportunity to read the book together with a nice group of people, to discuss it, voice your opinion or get my answers to specific questions. I’ll be there. And this is where you’ll find me. – The book and the discussion will be in German. What is a troll? No, I’m not talking about the naked giants from the Hobbit movie. I am talking about the people who annoy us online with their malevolent, disparaging opinions based on cluelessness, spiteful frustration and zero relevance. Those we call trolls. There are trolls to be found in online (book) reviews. They are some few people who basically only ever write bad reviews, and who do not stop at disparaging the medium (book, film, etc. ), but also launch massive personal attacks on the authors and media makers and on all those who have the audacity to like what they dislike. It is perfectly all right not to like a book or a movie. We cannot all like the same things. We also do not necessarily all have to like Tolkien. And it is equally acceptable to say so and state the reason for your dislike. Massive attacks on the creative minds behind – whatever – medium plus on those who confess to like the creative product will, however, put the reviewer very much in the proximity of trolldom. Mr. Frank (Spiegel Online) seems very close to overstepping this troll borderline line in his critique about the last Hobbit movie. He not only criticizes the movie – I have not seen the movie, so I cannot comment on that, maybe it is bad? – but he goes on criticizing everything and everyone who might somehow lurk and work in the “vicinity”, including those creative in the area as much as those who like the products of this genre. One full scale round of kicks in the shins. We are all stupid. He is the only one who is wise. That tends to be the overall problem with trolls. It’s never about the actual opinion but basically all about self-manifestation. But should one really use one’s considerable media clout to flaunt one’s somewhat dusty 70s culturally highbrow ego and offend large groups of the population in order to portray oneself as a kind of aloof and windswept King of Culture? Fairy tales and legends have always existed. They belong to humanity. 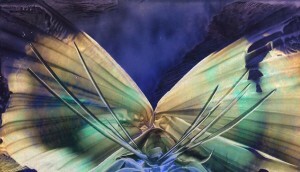 Archetypes are fixed in our thinking and feeling. Mr. Frank surely knows the word. Yes, fantasy – or rather speculative fiction – is entertainment. But entertainment is not necessarily objectionable as such. Mankind has always been entertained, has run competitions, told stories and made music. All this is entertainment. Only in Puritanism and comparably rigid religious or ideological systems is this a “sin”. Escapism is the derogatory term used in modern parlance. Everything is escapist. But let’s face it, even driving an SUV in a big city is already escapism, since you will not need your four-wheel-drive to brave the wilderness of suburbia. In the 70s there was a literary theory of Christian Enzensberger (not Hans-Magnus, that was his brother), the theory of sense deficit. To give a very simple and short explanation, this was the approach that EVERY kind of literature only served to embellish and mask the absurdity of the world through fiction. With this approach practically ALL literature would be escapist. But declaring escapism to be the sole purpose of speculative literature has already been chewed over many times and rightly disappeared into oblivion – particularly since the works and contents of speculative literature have evolved their own academic study field in which the researching academics actually know what they are talking about. Escapism – my goodness, does one really have to go back that far to find some ammunition for self-complimenting literary bigotry? They say that we, the “fantasy fans”, cannot distinguish between reality and unreality. But we can. We can because we know BOTH. It is the unimaginative “realists” that generally tend to fall for religious / ideological extremist groups, because they take the ludicrous at face value and have no experience with the reception of the fictitious. It is the “fantastic” that fine-tunes our sense of reality. Last but not least let me say a word about the LARPERS – so much disliked by Mr Frank: I much prefer people playing fairytales with plastic swords for recreation on the odd weekend to those who want to beat reality into shape with the right-wing slogans and oh so real baseball bats. Since I have joined Lovelybooks (the German equivalent of Goodreads), my books may be nominated for the Lovelybooks award. 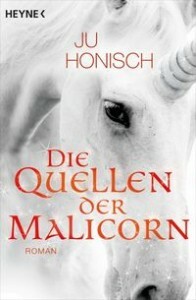 If you liked “Die Quellen der Malicorn” or “Schwingen aus Stein”, then I would be happy if you could nominate the book. This is where you have to go. Thank you! I’m not really an ardent party goer and tend to feel lost and overwhelmed very quickly at big dos. But this party is really nice: cozy enough to feel welcome and frequented enough to meet everyone who is someone in this scene and in this genre. I won’t go into name-dropping mode here. Favourable result: a new and interesting short story project did come my way, because at this meeting you have more direct contact with your “peers” than at the huge trade fair itself. 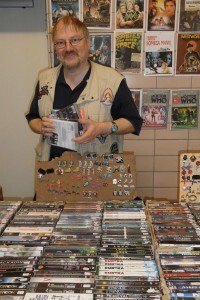 As always, the Saturday belonged to BuCon the “Buchmesse (=Book Fair) Convent”. If you are used to calling this type of event a convention, please be advised by veteran German SF fans that this is all wrong (in German). At this point I will refrain from joining a time-worn (and very boring) discussion about grammar and etymology. Whoever organises the event is free to decide what it should be called. However, the term “Convent” to me always tends to convey the image of colourful young men in full 19th century student union regalia or non-colourful old women with a pious mien. Neither of the aforementioned were present, though. Gathered here was the speculative fiction family for their very own kind of autumn rite. If I started name-dropping at this point, I would have to expand this blog post by several pages. Let’s try a different approach. Had Noah wanted to save all German speculative fiction writers from the flood he would have been able to tick off his list here without having to hunt around for stray specimens. And he would not even miss out on the dinosaurs. I did a reading at lunch time and enjoyed it quite a bit. So, I hope, did the audience. Well, they bought quite a number of my books afterwards, so one can assume that they might not have been too bored. Eventually I lost track of the event a little. I still had fun, though. Mind you, maybe I should plan my conversations a tiny bit more diligently in the future, because for some reason I obviously succeeded in NOT making it onto a single photograph or video clip, let alone managed to engage the media people for an interview or article (newspaper or blog). I am still a little miffed at that – or rather at me for my sudden PR-unawareness. Obviously I am good at being invisible. Should I need to establish an alibi for Saturday the police would scan the photos and report material and not find any hint that I was there at all. So: go to jail, directly. But I was there. Honest. The highlight of the evening was, as always, the German Speculative Fiction Award (Deutscher Phantastik Preis) Ceremony. The winners are listed here . I congratulate all those who won and of course all the final nominees. As an additional event Tom Finn got awarded the “BuCon Preis”, which was given out for the first time this year. 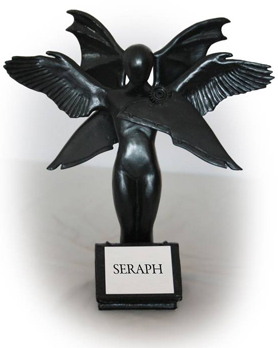 It is a kind of general creativity award for lifetime achievement (to date. We hope Tom Finn goes on being creative many more years.). Later that evening I went out to dinner with the short story authors of “Eis & Dampf” (Ice & Steam), who I would like to again congratulate for winning the German Speculative Fiction Award for the best anthology. Nice people. Nice food. Dreadful drive home. Now it is over again, that fifth season for book lovers. So now we can once again focus on the aspect of book-biz which is closest to our hearts: the actual writing.